I don’t normally associate Harrod’s with small, local UK producers of fine chocolate, spirits and gateaux, yet they do stock a large number of British small brands. I suppose my perception has grown over years of visiting and seeing the very posh brands on show, with spotlights being given to known luxury brands. I hadn’t really thought about smaller suppliers who fill Harrod’s shelves. Harrod’s is a luxury department store. All of the Harrod’s staff seem to know everything about every department – so if one was in ladies fashions and needed to get to technology, staff would be able to not only point the way, but also suggest the most efficient route. It is a mecca for the fashion conscious and the foodie alike, so it is no surprise I found myself there again after visiting the Patchi counter only a short time before, this time for a press event. 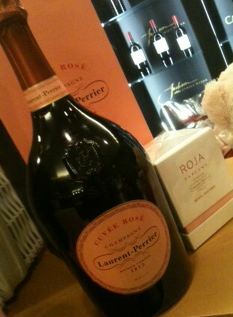 We were greeted with Laurent-Perrier rose champagne which was delightful and far too drinkable. 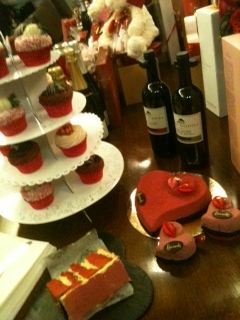 On the table before us, the delights for Valentine’s Day from Harrod’s. There was everything from Lick The Spoon chocolate biscuit hearts to a wonderfully beautiful plum liquor, made in the Japanese style with French plums. With marshmallow trees, Maison du Chocolat chocolates, new beautiful Godiva chocolates and more, it is easy to see why Harrod’s has a reputation for quality and luxury. 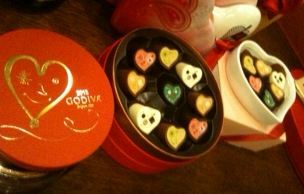 The Godiva chocolates particularly caught my attention, as one set of chocolates was in a delicate porcelain box. 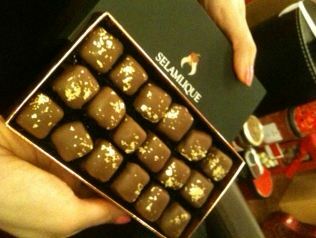 The chocolates had been designed for Valentines day with three new flavours. These three flavours were decorated with artistic prints from Hayon. The artistic design of the heart shape was then reflected in the shape of the porcelain box, as well as the inside of the round clear (possibly plastic) box. A hidden heart centre with heart chocolates. 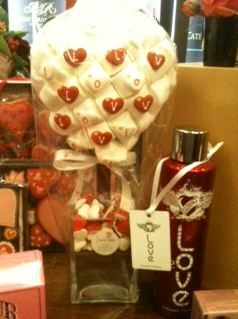 I have to admit to having quite fallen for the porcelain heart from Godiva. I did like the chocolate I tried which, while sweet, was not solid praline so quite nice. The champagne and candle combination I thought was a bit of luxury. I’m not sure how much it was but a large bottle of LP with a gorgeously scented candle from the exclusive perfumer Roja was not going to be inexpensive, unlike the delicious cakes which were shaped like hearts and had a hidden raspberry surprise inside. The raspberry jelly was delightfully tart and the perfect counterpoint to the chocolate mousse. A Harrod’s in-house exclusive cake for the holiday. These cakes were nest to a gorgeous pile of cupcakes and the most gigantic slice of cake with a delightfully crumby sponge with a hint of rose in the buttercream. Possibly the most reasonably priced luxury item there was the cinnamon and almond chocolate-coated Turkish delight, embellished with gold leaf. If you want to give someone a gift for Valentine’s Day that is luxurious and decadent and not at all sappy or covered in hearts, this is the gift you want to give. It is possibly the most chewy Turkish Delight I have ever tried, I have to admit. It was extremely chewy in fact. Possibly a good one to keep kids quiet or stop everyone talking at the office or dinner table as they try and masticate their way through the cinnamon deliciousness. It isn’t to overpowering in flavour but the chocolate was slightly drying. Overall I really enjoyed seeing all the small producers and large brands that Harrod’s supports. With edible flowers in candy or on chocolate, fancy water, delicious pastries, chocolates and more, the tat of Valentine’s cannot be found at Harrod’s, making it the perfect place to buy your bonbons from.